Recently, we had a chance to board Carnival Glory while it was docked in Port Miami. During our three hours on board, we got video footage, and photos, of different areas around the ship. Here is a brief tour of Carnival Glory. 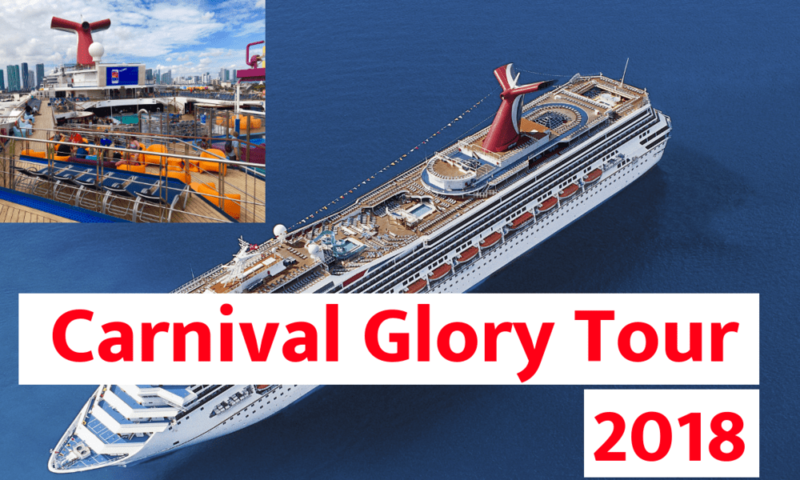 If you’d like a more detailed look, watch the Carnival Glory Tour (2018) on the Cruise Radio YouTube Channel. The video is also on the bottom of this post. When you cross the gangway, you’ll enter deck three of the Carnival Glory – which dumps you right into the atrium where the DJ is set up. The atrium on this ship consists of decks three, four, and five. So, if there’s an atrium party happening that you don’t want to be right in the middle of, just take a rail on deck four or five and enjoy the people watching! You’ll find the show theatre of this ship in the forward part of the main atrium. One thing I love about this class of ship is that you can enter the theater from decks three, four, or five. This is compared to some other ships where you can only enter from two decks. This gives you that third option for where you want to watch the show from. I personally have a hard time sitting still through a whole show – even though it’s only 45 minutes – so I like to sit at the very top and take a back table. This way, I can just scoot out without bothering anyone. Another thing I like about this theatre is that there aren’t a lot of poles in the theatre compared to Carnival’s newer ships – especially the Vista-class ones – where you have a hard time seeing the stage through all the large poles obstructing your view. There are still poles on the Glory (because the polls have to be there to hold the roof up, right? ), there just aren’t as many. The theater has excellent lines of sight. You’ll find the library on deck four (that’s that middle deck between where you enter the ship and the Promenade). This is really a chill place if you want to play some games or check out a book. What I like to do is bring a book on the ship that I want to get out of my house. Then, once I finish reading, I put it back in the bookshelf and go about my day. This way someone else can enjoy it. As you round the corner, you’ll find one of the two main dining rooms on Carnival Glory. These include the Golden Restaurant in the mid-ship, and the Platinum Restaurant in the back – or the aft – of the ship. Both of these restaurants are two stories. The difference between the two, obviously besides the location, is that one is for any time dining – which is anytime between 6 p.m. and 9:30 p.m. – and the other is for set dining – 6 p.m. or 8:15 p.m. Now, the dining time you decide is totally up to you. I will tell you the anytime dining is typically the first to go, followed by the early dining – depending on the demographics of the ship. I was on a 14-night sailing and the only option left was late dining. The early dining was waitlisted, and the anytime dining was completely gone. Once you figure out when you want to eat, make sure you book it ASAP because otherwise, you’ll be put on a waitlist and you probably won’t get the dining time you want. You’ll still get a dining time, but maybe not the one you were hoping for. You might get locked out of early and be stuck on late, or locked out of late and stuck on early. (If you wait too long, you can go ahead and count anytime dining out because that’s typically the first to go). Outside of the mid-ship dining room, on deck four, is where you’ll find the photo gallery. Photo stations are set up throughout the evening on deck four and five. The photo gallery hugs both sides – port, and starboard – of deck four. Heading towards the back of the ship, you’ll spot the Ivory Club. You’ll find salsa dancing, a live band, and, sometimes, even a guy playing the piano (but it’s not really a piano bar – that’s up on deck five). The Ivory Club is really a cool, chill, and jazzy type of club. Just behind the Ivory Club is the Platinum Restaurant. Again, another two-story main dining room on deck three and four (right above this restaurant, on deck five, is the Punchliner Comedy Club – where the comedy shows are held during this voyage). People like to sit in the back of this restaurant because you can see all the glass that’s in the back of the ship. You can get a pretty cool panoramic view while you’re enjoying dinner – depending on what time your dinner is, what time of year it is, and when the sunset is. So somethings you want to consider when making your dining room reservations are what time dining you want, and also what views you want out the back window. Up on deck five, you’ll find the Sky Box Bar: a sports bar connected to the casino. There is also a casino bar, where people can go to smoke and watch some TV, but Sky Box provides more of a sports bar type of atmosphere. They have TVs all over the walls, and a sport’s ticker that pretty much goes 24/7. If you ever can’t sleep, or you want to stroll through here in the middle of the night to see how your favorite team did, you could watch the ticker on the wall. It has all the major scores like MLB, NHL, and NFL. Whatever the season is, you’ll find the scores there. They play a lot of soccer here as well – whenever there are no football games going on. Walking outside of the Sky Box Sports Bar, you get dumped into the atrium. Again, whenever we were on board it was during Christmas time, so they were just decking the halls of the ship. Carnival is, of course, known for their glass elevators in the main atrium because their new ships don’t have them. Carnival Breeze was the last Carnival ship made that has the glass elevators in the main atrium. Thankfully, on this ship, they have four of them going from deck two all the way up to deck 11. If you want to get some pretty cool aerial shots of the main atrium, hop on one of the elevators and stand all the way back against the glass to take them – it’s pretty cool. Once you make your way through the fun shops, which are also on deck five, there are two ways to walk to the back of the ship. You can either walk through the promenade, which is the walkway that goes right to the left side of the casino, or you could just walk straight through the casino. It is a smoking casino, however, so if you have smoke issues, take that into consideration. There are some weird statues on this ship with the typical Joe Farcus designs. There’s some seating here on the left-hand side, and then more tables, and some skill machines – like the one where you throw quarters in and try to get more to come out. The promenade really comes to life at nighttime because there is a band that plays right in front of the casino. So, this area could be a little hard to navigate between 10 p.m. and one in the morning, when the band is playing. Also, when you’re making your way back, you’ll have a lot of photo opportunities in different kind of backdrops (especially at nighttime or during a formal night). Some of them are green screens – where they put in a photo of the ship or what have you – and some of them are just straight up backdrops of a ship wheel, or things like that. You’ll also find a coffee shop on the promenade, and Club O2, which is the teen club. Park West has their art gallery auction set up on deck two, where you can guess the price of the art for a prize. The Alchemy Bar is also located on the very back part of deck two (on your left-hand side). There is an arcade just before you get to the nightclub on deck two, which is fun because they have those skill machines where you try to align the arrows up just perfectly to win yourself an IPad, iPhone, Mac Book, or some kind of other really expensive technology – whatever they have in the machine at the time. During certain days of the cruise, for an hour per day, they have what’s called a “power hour” where everything is 50-percent off. If you’re an arcade person, or you just want to kill some time and have some fun, that’s definitely something to check out – It’s always a good time in there. The nightclub reminds me of Beauty and the Beast with these candles. I know I keep mentioning his name, but Joe Farcus did a number on this ship – with the public areas, the statues, the drapery, and all of that. It’s not as ornate as Carnival Liberty, with all the cast iron all over the ship, but it’s probably a close second. It’s also the same class of ship to the Conquest-class. If you wanted to get a nightcap at the Alchemy Bar, once you come out of the nightclub, it’s back here as well… so that’s an option for you. Just past the Alchemy Bar is the piano bar. There is signage, just before you walk into the piano bar, that’ll tell you if it’s an adult themed show or just a regular, good old sing along. But, I don’t think many people bring their kids into the piano bar anyways. In fact, I don’t think many kids want to go to a piano bar. My first piano bar experience wasn’t until I was 21 years old. In the back lounge of the ship – called the Ebony Cabaret – is where the Punchliner Comedy Club is held. There are different showings throughout the cruise, but you’ll want to make sure if you are going to a late-night show (especially the rated R ones) to get there early. There will be a line out the door and down the hallway – sometimes backing into the piano bar – of people trying to get in. Once it fills up, it fills up. I mean, they’ll let you squeeze in there, but you will not find a seat. The comedy shows are just that popular on Carnival Cruise Line. Just outside of the aft lounge is the Bar Blue. I’ve never really seen a live band on the stage, mostly just karaoke setup. If you’re not a nightclub or casino person, and there are no shows going on to keep you entertained, you could just pop into Bar Blue to hang out – or belt out your favorite songs. Now we are on deck nine aft where the pool is located (You’ll also find the Seafood Shack here: an a la carte dining option with fried shrimp, clams, lobster rolls, oysters, and crab legs. You can buy food here at the market price). The pullback here is, depending on what sailing you’re on, it’s either adults only or it’s not. On my sailing, it was adults only… and it was enforced, too. A kid actually did a cannonball and the lifeguard said, “hey, get out of here kid. It’s only 18 and up.” But, on Carnival Liberty, I’ve seen kids swimming in it without any problem at all. So, who really knows if or when they choose to enforce it… just know that it may or may not be adults only. One part of Carnival Glory (and this whole class of ships) that I really like is the seating area behind the pool. If you’re in the Lido buffet and want to sneak away when there are no chairs inside, you’ll normally find plenty of seating at these corner tables. Walking through the main area down to the Lido deck buffet, you’ll find your typical buffet set up. Now, one thing about this ship that some other ships don’t have is the mirroring buffets. You have the buffet area in the back (the aft part of the ship), then you have a buffet towards the front side as well. The only real difference between the aft and midship buffet is the Mongolian Wok station on the forward side. Other than that, it’s pretty much the same. You have your hot meals, your salad bar, and your dessert station at both. You can enter the steakhouse on the ship, called the Emerald Room Steakhouse, through the buffet as well. It is located one deck above the Lido deck, on deck 10. If you’re walking from the pool into the buffet, you’ll see this big staircase that’ll take you to the steakhouse. Of course, the steakhouse is $38 per person, and the reservations are (I don’t want to say required because I’ve seen people kind of just go in last minute) definitely suggested. Now hands down, one of my favorite venues on Carnival Glory is going to be the Old Fashioned Barbecue that’s located on deck 10 aft, just above the Lido deck. The Old Fashioned Barbecue has the same type of barbecue offerings that they have on the ships with the Guy Fieri partnership – Pig and Anchor – but for some reason, whether it be branding or licensing, this venue is only branded as Carnival Old Fashioned Barbecue. They offer barbecue pork, chicken and beef, mac and cheese, baked beans, potato salad, coleslaw, and a dinner roll (and you have some barbecue sauces to choose from as well). This venue – also complimentary – is normally open from noon to 2:30 p.m. on sea days, and on embarkation day. So again, check your fun times guide, because these times could change. If you’re one of those cruisers who is not a big fan of sitting out in the sun and roasting all day, you could hop up to deck 10 – the Panorama deck – and pop underneath one of the outside awnings on the Panorama deck. This way, you can stay covered while still enjoying the outside, and the nice connection with the water (this is located on both port and starboard side). Walking up onto deck 11 aft, you’ll find the Spa deck. This deck offers a jogging track, but you’ll have to run around seven laps to even reach a mile. If you don’t mind running in circles, then that just might work for you. You also have a basketball court in this area, as well as the iconic funnel (the big whale tail and the smokestack of the ship). There is also a big open space where it looks like – once upon a time – they have (or maybe still do) played shuffleboard. Also, there are chairs out here, so it’s also a nice place to lay out in the sun during the day. However, keep in mind, there are no pools in this area, so it is a good place to escape the pool crowds. When you’re on Lido deck nine and you look up, you can see how the seating is tiered. There are also two hot tubs on this deck, along with the beach pool and the dive in movies. It’s kind of like amphitheater seating so, if you wanted to catch a movie, you’re not having to lay on the ground and stare up at the screen. You can get a more elevated seat, which is really cool. The water park, or Water Works area, on Carnival Glory was installed during it’s last dry dock in 2017. You have two slides, a dump bucket, and a little splash area for the kids – they really seem to enjoy it. The Sundeck 12 on Carnival Glory has a weird configuration because the port side is devoted to Camp Ocean (so you have the kids’ playground out there) but on the starboard side, you have part of Serenity (but Serenity still goes up to two different decks on this ship). Then, if you go up to the Sky deck, which is deck 14, you’ll find two hot tubs. Serenity also has both port and starboard (or left and right) sides of the ship all the way forward on this deck.